↑ "By UNMIK administration direction 1999/2". Unmikonline.org. Retrieved 30 May 2010. ↑ ਦੇਸ਼ ਦਾ ਸਿਰਫ਼ ਯੂਰਪੀ ਹਿੱਸਾ ਹੀ ਯੂਰਪੀ ਸੰਘ ਦਾ ਮੈਂਬਰ ਹੈ ਅਤੇ ਯੂਰੋ ਵਰਤਦਾ ਹੈ।The Caribbean Netherlands introduced the United States dollar in 2011. Curaçao, Sint Maarten and Aruba have their own currencies, which are pegged to the dollar. ↑ "By monetary agreement between France (acting for the EC) and Monaco". Retrieved 30 May 2010. ↑ "By monetary agreement between Italy (acting for the EC) and San Marino". Retrieved 30 May 2010. ↑ "By monetary agreement between Italy (acting for the EC) and Vatican City". Retrieved 30 May 2010. ↑ "By the third protocol to the Cyprus adhesion Treaty to EU and British local ordinance" (PDF). Retrieved 17 July 2011. ↑ "By agreement of the EU Council". Retrieved 30 May 2010. ↑ "Monetary Agreement between the European Union and the Principality of Andorra". Official Journal of the European Union. 17 December 2011. Retrieved 2012-09-08. ↑ Rosenberg, Matt (23 May 2010). 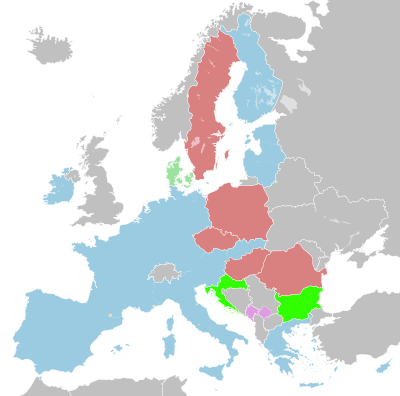 "Euro Countries: 22 Countries use the Euro as their Official Currency". About.com. Retrieved 27 December 2010. 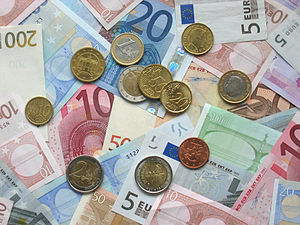 ↑ "EU ministers back Estonia bid to join euro". BBC News. 8 June 2010. Retrieved 19 July 2010. ↑ "Total population as of 1 January". Epp.eurostat.ec.europa.eu. 11 March 2011. Retrieved 17 July 2011.